The best cake mix and store-bought frosting combination is obviously funfetti with pink frosting, right? 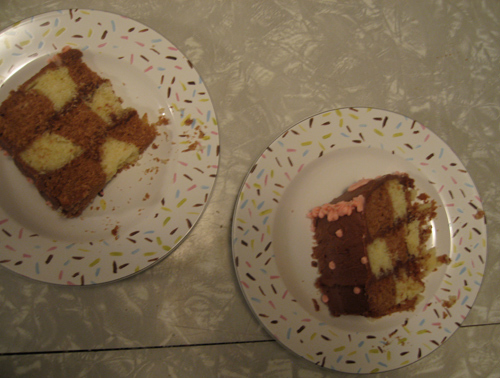 That knowledge directly contributes to why Jake wanted his checkerboard birthday cake to have pink frosting…I promptly told him that it is supposed to have chocolate frosting, but well… I did pink accents. So there you go. This was my first time making it so I wanted to follow the rules. Maybe next year it will have all pink frosting, who knows? 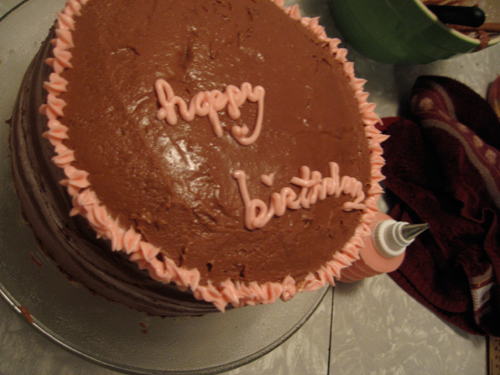 In other news, I wrote “happy birthday” on the cake too low. Rookie mistake! I had to put Jake’s name first… “Jacob, Happy Birthday”. Ridiculous! Now I know. After dinner we sliced this cake and whoa and wow! 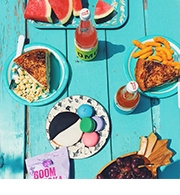 Delicious and pretty. And we were super full and full. But there’s always room for cake! Preheat oven to 325 degrees. Spray three 8-inch cake pans with cooking spray. 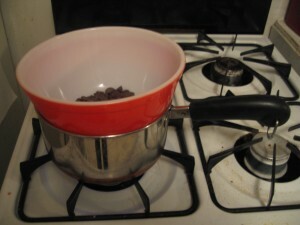 Melt chocolate over hot – not simmering – water. Set aside to cool slightly. 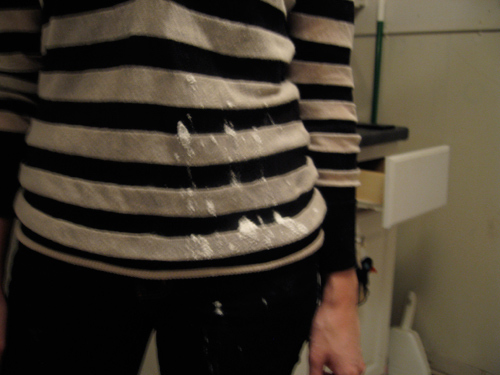 In a medium sized bowl, combine flour, baking powder and salt. Set aside. In large bowl, cream butter and sugar. Add eggs one at a time, beating after each addition. Add vanilla. 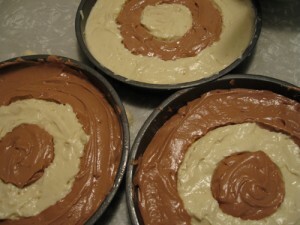 Add milk and flour to butter mixture, alternating each until batter is smooth. Beat at medium-high speed for 30 seconds. Divide batter in half (approximately 3 cups). Stir melted chocolate into one half of the batter until uniform in color. Place pans in the center of the oven and bake for 25 minutes or until cakes spring back lightly when touched and a cake tester comes out clean when inserted into the center. Rotate cakes half way through baking. Allow cakes to cool in pans, sitting on racks for 10 minutes. Loosen sides with a knife and invert onto greased wire racks to cool completely. When cool, stack cakes so outside colors alternate. 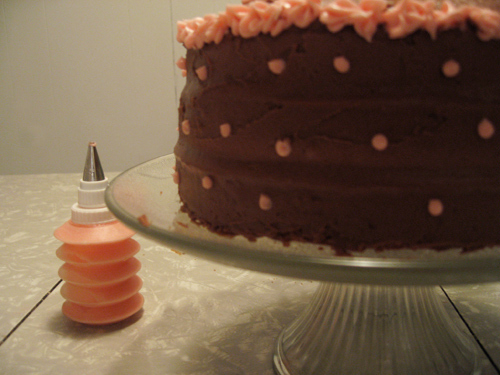 Use a very thin layer of frosting between layers so as not to distract from the checkerboard effect. *If you don’t have this little kit with the divider you can carefully arrange the batter in the same manor by eye-balling it. It’s the way Fannie Farmer does it. She suggests filling it by making the ring around the outside then moving inward. Or tape parchment paper into rings? or different sized circle cookie cutters? Melt chocolate in the microwave and set aside to cool slightly. Heat milk to boiling, remove from heat, add 3 cups of powdered sugar all at once, and beat until smooth. Add melted chocolate and cool to lukewarm. Add butter and beat until combined. Add salt and vanilla and beat vigorously. Add remaining powdered sugar 1/2 cup at a time until consistency is thick and creamy and dreamy. Frost the cakes! 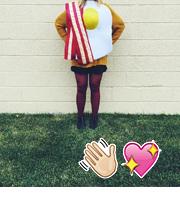 Remember to only lightly frost between the layers so the checkerboard stands out! Not only does the cake look and sound delish – Elliot is adorable! Thanks! I think you should stop by and have some. Elliot’s been daydreaming about this cake for days. So that’s how you get the cake to look checker boardy. I think Elliot has “designs” on that cake. Don’t turn your back. 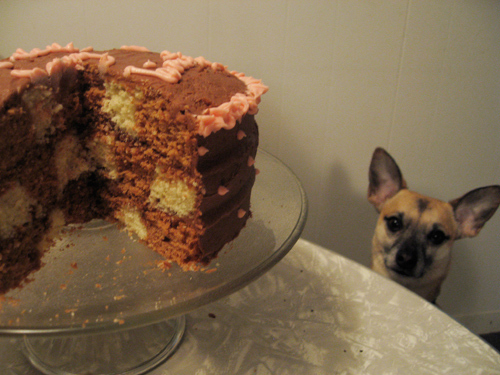 . .
Elliot would eat that cake in a second, if it was accessible when I left the house. …he might’ve stolen black and white cookies off the table last year… and somehow left no evidence.